They have three invisible zones that allow easy viewing transition between zones - allowing sharp vision from near to far in one lens. Progressive lenses are designed using state-of-the-art optical technology, and when adjusted to the individual’s specific needs, they provide great wearer satisfaction. Sometimes, however, a little training is necessary for people to get used to wearing progressive lenses. Progressive lenses are absolutely the best option for maintaining perfect vision at all distances. Wearers who have got used to them do not like to be without these high-tech lenses. Though wearers should be aware of a few things, in order to obtain the greatest wearing satisfaction from their spectacles. The first priority is a personal consultation with an optician. As every person is an individual, his or her eyes and viewing behavior are also unique. As a result, a qualified optician will do an exact eye care analysis. For example, he will ask, about your job and hobbies, in order to get an idea of your viewing habits. Your posture and the shape of your head are also taken in consideration during the consultation. 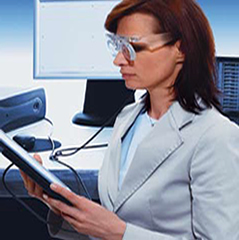 Precise vision testing plays a special role in making progressive lenses work perfectly. 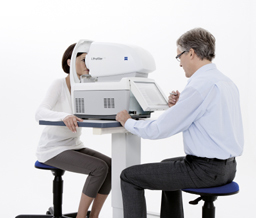 Not only are both eyes individually measured, binocular vision is also tested to determine the necessary lens power. Only by doing this can the suitable reading and distance powers be determined. Precise fitting measurements are also necessary. The center of the pupil must be aligned to the center of the spectacle lens in order for the lens to work properly. For more sophisticated progressive lenses, additional measurements may be needed. But don't worry: The rate of success for modern progressive lenses is nowadays extremely high. Nevertheless, it is important that the wearer takes time to get used to their new progressive lenses. The eye and the brain have to learn to adjust to the different refractive powers of the lenses. Here is an example: When someone wearing progressive lenses climbs stairs, they will look through the lower portion of their lenses. In progressive lenses, this is the area that is adjusted for a reading distance of approximately 40 centimeters The stairs are, of course, depending on their size, clearly further away. Thus the stairs will be viewed with distortion. The good news: The sense of sight is highly complex - and it is also a very adaptable system. Within a short period of time, it is able to learn and to adapt to new viewing conditions; so when climbing the stairs, a wearer simply points his head somewhat further downwards. What will I experience when getting used to wearing progressive lenses? Areas of soft focus at the edges of the lenses. More head movement - and less moving of the pupils, especially for near distances, since the field of view for near-distances is located in the lower part of the lenses. On the whole you have to get used to the individual areas of vision and their position in the spectacles: in the lower area you will see short viewing distances clearly. If you look in the distance, you will have to do this using the upper portion of the lens to obtain clear vision. All of this is completely natural, and will diminish within a short period of time - as you quickly adapt to your progressive lenses. However, more importantly: You should wear your new progressive lenses daily from the very beginning - from morning until evening. And age makes no difference, though the earlier you start wearing them, the easier it is to get used to them. If your new progressive lenses still do not feel comfortable after an adaptation period of approximately two or three weeks, your optician should gladly help you further.